Each time you make a reservation through this website, your reservation is made directly with Elova Guesthouse. As such, you are guaranteed the lowest possible rate, unlike reservations made through third party systems (whose prices include the given platform’s commission). To send a reservation enquiry directly to Elova Guesthouse click here! 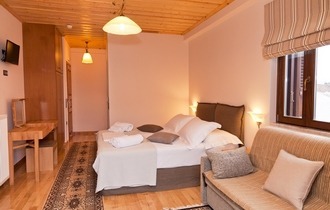 Elova Guesthouse is located at an ideal spot in Zatouna, at an altitude of 1,050m (3,445ft.) and is only 3km from Dimitsana village. It is built on one of the mountain slopes of the area and has an unobstructed view of the Lussius river gorge, the monasteries and the valley of Megalopolis. It is a modern construction (2012) which has retained the local traditional architecture and is in perfect harmony with the natural environment. In Elova Guesthouse’s lounge a luxurious breakfast is offered with homemade and local foods such as homemade cake, pitas, homemade marmalades, loukoumades, local honey, coffee, milk, cereals, ham, cheese, fruit, juices, eggs, toast and much more. In the lounge or the outdoor veranda during the summer months, during the day coffee and local teas with sweets are served. During the summer months, the outdoor areas are available for social events, and are ideal for children's games. You can also find a taverna with exceptional food which can cater to your needs on the grounds of the guesthouse. Elova Guesthouse has been characterized by the GNTO (Greek National Tourism Organization) as a 4 key establishment and combines tradition with comfort and quality in the best way. It is 206km (129miles) from Athens, and is very accessible. Far way from crowded urban centres, you can visit Zatouna and nearby areas, which will fill you with new experiences, and unforgettable images.